Like many runners, I spend my Tuesday nights at the track running a hard set of intervals. For the last few weeks, I’ve spending Wednesdays doing recovery workouts, which includes running about six miles at a 6:00 per mile pace. My heart rate barely breaks 135 beats per minute and I’m not breathing hard at all. It’s not as if I’ve morphed myself into Geoffrey Mutai or Meb Keflezighi—I’ve just been using an Alter-G treadmill to teach my body to run faster while recovering. We’re all looking for “free speed” in our training. While I have been in rehab for my plantar fasciitis procedure, I started running on an Alter-G treadmill. While playing around with different combinations of gravity and speed, I ran for a mile or two at a 5:30 pace at about 60% gravity (walking at 60% gravity on an Alter-G feels like walking on the moon, but running feels much more natural). The next day, my hamstrings, glutes, and hip flexors were all quite sore. As I talked it over with my physical therapist, he told me that he wasn’t surprised—even though I wasn’t fighting gravity nearly to the same degree while running on the Alter-G, my legs had to move just as fast as if I were running a 5:30 mile. My hip flexors and glutes had to work harder to keep up with the fast-moving belt. Oddly, the biggest strain on the hamstrings come not during the propulsive phase of running—instead, they get fatigued from slowing down the swing leg at the front part of the running stride. In my case, that swing leg was obviously moving a lot faster and so the braking forces were a lot harder for my poor hamstrings to manage. This experience convinced me that an Alter-G treadmill could be a secret weapon in gaining extra speed in my running. After all, if my legs were having trouble with the demands of running at low-gravity, how could they possibly keep up once gravity fully re-entered the picture? While this realization might make speedwork on an Alter-G treadmill seem like a natural idea, there were a few problems with my theory. First, once my running speed gets above a certain point, I start developing hot spots in my shoes. While an Alter-G may make it easier to sustain that pace longer, it doesn’t keep blisters away. This is particularly true because the air bubble on an Alter-G treadmill can get really warm. Secondly, along with blisters, my form deteriorates once I get above a certain running pace. My third problem is that intervals are really tough mentally. For instance, when I’m running 800’s at my MaxVO2, it takes a lot of focus to keep going. Running with that kind of focus on an Alter-G (or any treadmill for that matter) is excruciatingly difficult for me. As a consequence, I lower my effort level, which lowers the effectiveness of the workout. Despite these setbacks, I kept fidgeting around with different ways of using an Alter-G treadmill—all the time running either a little faster (e.g. 7:30 pace) or much faster (e.g. 6:00 pace) than my normal daily runs. As I started getting used to running on an Alter-G treadmill more frequently, I noticed that it was the best form of recovery imaginable. Apart from my early adventures with speed, I found that I always felt much better the day after running on an Alter-G treadmill: my muscles didn’t feel heavy or sore and my legs had plenty of “pop.” I also noticed that I was getting faster on my daily runs. Not surprisingly, my legs were having less difficulty keeping up. As my Tuesday night track workouts always left my legs feeling heavy and tired on Wednesday mornings, I naturally gravitated to placing an Alter-G workout on Wednesday. This seems to be the magic bullet so far. So what do these “overspeed recovery” workouts look like? First, I start with a few minutes of gentle running at 90% gravity and then start increasing the speed while lowering the gravity. The goal over the next ten minutes is to get to a running speed that is close to my maxVO2 running pace (which is pretty close to the best pace you can maintain for six minutes)—and then fiddle with gravity to make that happen in such a way that I’m still at my normal recovery heart rate and while minimizing impact. This last factor (“minimizing impact”) is a little hard to quantify but the basic idea is that strides should feel quick and light—not a thunderous pounding. Over the last few weeks that I’ve tried this workout, the level of gravity needed depends very much on my level of fatigue. On Wednesdays after particularly brutal track workout, I may be running as low as 60% gravity (virtually floating over the treadmill) whereas it can be as high as 75-80% if I’m feeling fresh. As I’m ramping up my volume right now, I’m trying to keep my heart rate very low and using the Maffetone “180-age” guideline. That means that I try to keep my heart rate between 120-130 beats per minute. In other words, it’s very easy running. With a current volume of about six miles a day, this means I’m running about 30 minutes at 6:00 pace plus a warmup and cooldown. To keep boredom away, I fidget with the speed a little bit—increasing or decreasing by a few tenths of a mile or steadily increasing until I reach the blister threshold (which for me is around 11.2 mph). By Thursday, I’m back to normal and feeling peppy. While it’s a bit early to make predictions, I think this training is helping me get faster. Even though my volume is taking a pretty steep rise, my speed is also notching up as well. At the track a week ago, I was pleasantly surprised that I had plenty of speed in a fast set of 800 repeats. Ideally, I think that overspeed training on an Alter-G would go well with hill repeats. The reason is that running up a hill accentuates the effects of gravity because you’re obviously working against it. Years ago, I remember reading a study about baseball pitchers who experimented with throwing baseballs of varying weight. At first, the coaches thought that making them throw heavier baseballs would increase their strength—thus making their pitches faster. But this theory didn’t work. Next, they tried using lighter-than-normal baseballs so the pitcher could move his throwing arm faster—maybe that would translate into faster pitches. Unfortunately, this theory didn’t work out either. But when they had the pitchers alternate throwing heavier-than-normal and lighter-than-normal baseballs, then their pitches got faster. If the same logic holds true, then doing both lighter-than-normal running (e.g. 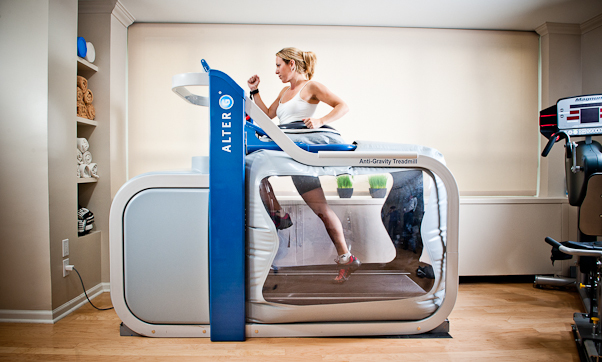 an Alter-G) together with heavier-than-normal running (e.g. hills) might yield the biggest benefit. In addition to “overspeed recovery” training, there is another form of training that the Alter-G is particularly good for—the weekly long run. I’ll save a description of this other key staple in a runner’s program for my next post. While Alter-G treadmills used to be hard to find, they are now popping up everywhere. You can easily find one near you by visiting http://www.alterg.com/product/find-an-alterg/.